The other day I wrote about the old Blue Jays logo and posted a picture of my favourite Blue Jay of all time, #11 George Bell. This picture of George Bell reminded me of something, but what? The video for Lionel Richie's "Hello" tells the story of a blind arts student sculpting a likeness of Richie's head. Picture that bust of Richie in your head. 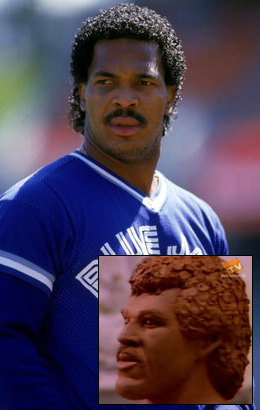 Is it Lionel Richie, or did that blind arts student sculpt the likeness of George Bell.